I was really excited when today’s fragrance came out but it’s taken me this long to get my bloody sniff on it. I love Ulrich and when I saw APSU in a split recently I went ahead and grabbed a decant. You want to wear green fragrance but are bored by the galbanum rich CHANEL No 19, Silences, Niki de Saint Phalle and Vert Boheme? 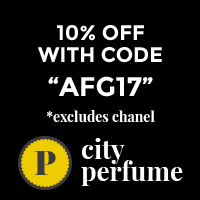 You have had the green grass/peony/cucumber scents beyond your ability to bear? I think I’ve found the remedy. Here we have green leaves like soft pulpy hydrangea and the bitter snap of camellia leaves, they are glassy smoothed by the cool powdery green of coriander seeds. The heart is a floral bouquet, dewy and satin soft against your cheek given a zing with pepper. The layers unfold slowly and give you time to savour each new facet. To notice the changes though you need to be paying real attention because they happen completely under the radar. If you’re living your day there will be moments where you are reminded you’ve got fragrance on because it has shape shifted. APSU is never a big scent, once the initial extravagance has blown off you get a beautiful low level crisp green scent that works beautifully here as autumn moves to winter but I think it would be wonderfully cooling in the hot summer months too. Refreshing to the very end and unusual enough to keep even the most dedicated perfumistas nose sniffing. Open to everyone worldwide who follows AustralianPerfumeJunkies via eMail, WordPress, Bloglovin or RSS. Please leave how you follow in the comments to be eligible. I must be able to check that you follow so if you have an email address on your gravatar that’s different to your follow address then please email me so I know. Yes, you can start following to enter, in fact it’s encouraged. Entries Close Sunday 18th June 2017 10pm Australian EdsT and winners will be announced in a separate post. The winners will have till Sunday 25th June 2017 to get in touch (portia underscore turbo at yahoo dot com dot au) with their address or the prize will go to someone else. Following by email. Thanks, Morrigan. Cedar wood in Nightscape, which sounds fabulous. APSU sounds perfect for these days when temperatures are reaching 40°. I follow by email. Thank you! Black pepper, aperture. Follow through email. I think the jasmine in Nightscape must be lovely. I follow APJ via email. Hi I follow APJ via e mail and Facebook.I choose LightScape and it has notes of iris. Sicilian lemon in Lightscape sounds delicious. I follow APJ by email. I follow via email mainly. I never heard of this house! Thanks for the education. I don’t have many green frags in my wheelhouse. Actually, none. I like them but it’s an area I haven’t explored much. I love grassy scents. Sometimes, “green” scares me because I think “bitter, herbal, medicinal, vetiver.” So, I haven’t reached out to sniff. Nightscape sounds interesting! Green with geranium and leather. Nightscape-amber. I follow by email. This does sound cooling for the summer. Thanks for the draw. Keeping with the theme: geranium leaves in Anvers. Following by email. Thanks for the draw opportunity. I have Lightscape from Ulrich Lang so I will choose as ingredient from Lightscape which is Rose. I follow APJ by email and Facebook. I follow through my email. Anvers 2 and rhubarb. Tthanks for the giveaway, I follow via email. Nightscape looks like my cup of tea with soft leather notes. Thanks, Portia, I follow by email. I hadn’t known about this house before, either, so thank you. Lightscape has caught my attention, with its Sicilian lemon. APSU sounds great; I like fragrances that move with the seasons. I follow by Feedly RSS. While I do love galbanum, this sounds so fresh and unique, I think I could love it. Thanks for the chance! Amber in Nightscape. I follow via Facebook. I follow by email. Thanks for the draw! Just when I was contemplating Chanel no 19, I don’t usually wear any green frags, actually don’t have any.